Atlètico de Madrid, who have enjoyed considerable success over the last few years – both domestically and in Europe – left the iconic Vicente Calderon after over 50 years to set up home at the new Wanda Metropolitano stadium. The 68,000-seat stadium, based in the San Blas-Canillejas district of Madrid, has given a new lease of life to the Community of Madrid – or La Peineta – stadium, which was originally opened in 1994 as part of Madrid’s unsuccessful bid to host the 1997 World Athletics Championships. The stadium, which had an approximate capacity of 19,000, held minor sports and cultural events for a decade until its closure in 2004. In 2011, Atletico Madrid revealed plans for the new stadium, before eventually playing their first game at Wanda Metropolitano in September 2017. Cruz y Ortiz Arquitectos designed the original La Peineta stadium back in 1990 and were again commissioned to significantly extend and revamp the venue, with the aim being to turn it into one of the best football stadiums in Europe. When it came to the new design, Cruz y Ortiz proposed a double design objective; they wanted to maintain the well-known, recognisable image, all while forming a harmonious combination between the extension and old design. This needed to be achieved while creating a stadium that would become synonymous with Atletico Madrid as a club. Once Wanda Metropolitano had been redesigned and built, the club had to ensure that the technology going into the venue was of the highest standard – especially with the aim being to make it one of Europe’s five-star stadiums. 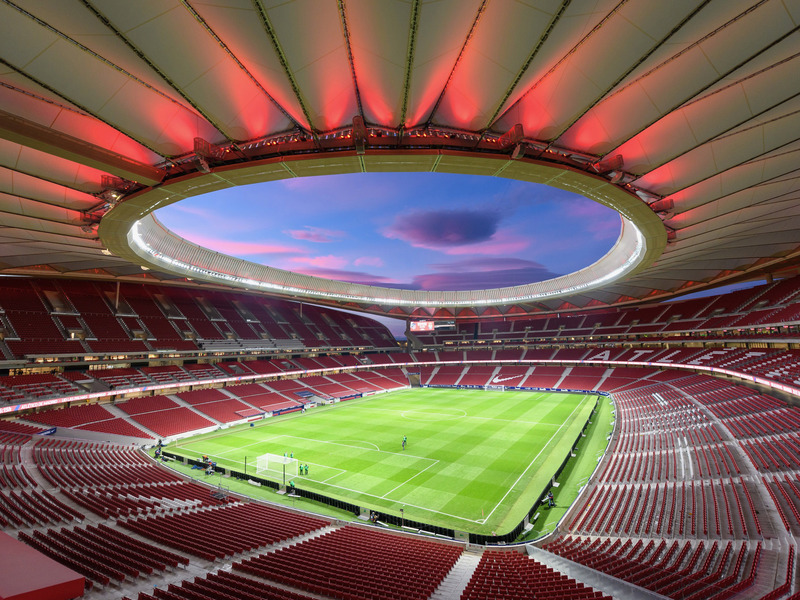 One of the main aspects to consider was the lighting throughout the stadium, which led to Atletico Madrid signing a four-season agreement with Philips Lighting for the company to be their official lighting partner. As part of the agreement, Wanda Metropolitano was the first stadium in the world to benefit from Philips ArenaExperience multi-purpose LED stadia lighting system, which encompasses the LED lighting for the pitch, stadium façade and hospitality areas. The lighting is designed specifically for the stadium, bringing it to life for visitors from the approach right up to when they enter. The roof of Wanda Metropolitano is equipped with Philips VavaFlood LED lighting, which has the ability to display more then 16 million colours. The VavaFlood LED lighting is used in conjunction with the dynamic Philips ColorKinetics on the stadium’s façade to create spectacular light shows. The dynamic lighting system on the roof can be operated independently, too. The new Philips ArenaVision lighting system, with 336 Philips ArenaVision LED floodlights, is used to illuminate the pitch. The system meets all the latest La Liga, UEFA and FIFA broadcast standards, ensuring maximum quality for television transmission. Not only that, but the LED floodlights can also be synchronised in light shows before and after the match. 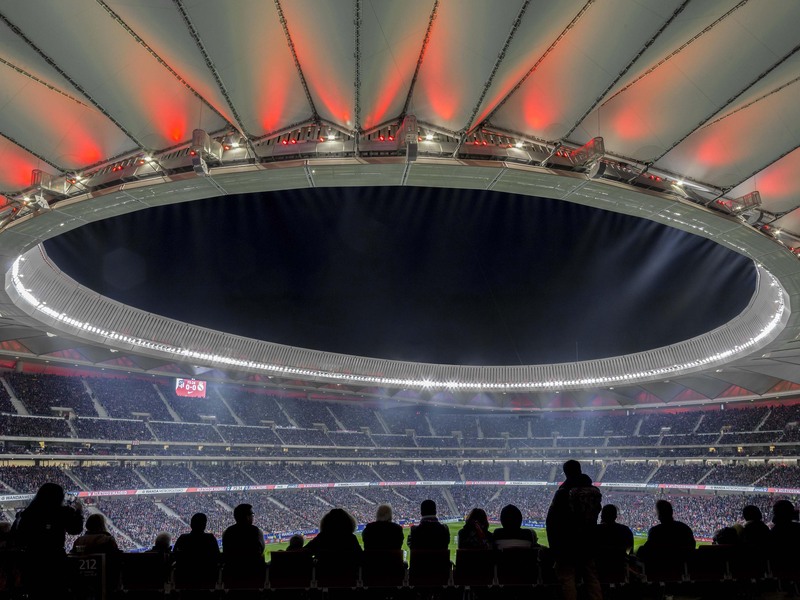 Along with the roof, façade and pitch lighting, Philips provided Atletico Madrid’s Premium Neptuno and VIP hospitality areas with efficient, high-quality LED lighting, which delivers energy savings of more than 60%.